Anyone contemplating a premium Ultrabook doesn't have to look too far past the Dell XPS 13. Last year's model offered excellent build quality, all-day battery life and a choice of high-quality screens. Yet unlike many others in the Ultrabook business, the inevitable transition to Intel Core 8th Generation Core U-series processors - doubling potential performance - is more than a drop-in upgrade for the 2018 itteration. Dell has seen fit to revamp the chassis, move stuff around, and get rid of a few ports. Enter the new XPS 13. 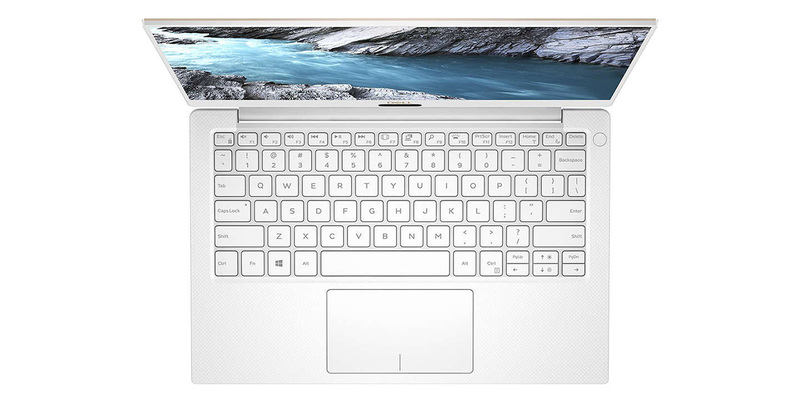 The latest XPS 13, model number 9370, stands out by more than mere technical specification. Alongside the standard silver and black colour scheme synonymous with the range, Dell has introduced a rose gold version. Nothing new in that, because it's been done before, yet this time the interior section is presented in an off-white known as 'alpine' and available for a $50 premium in the US. At the time of writing, this model is only available over the pond - UK customers will have to make do with the bog-standard silver and black, unless purchasing from an authorised retailer instead of Dell itself. That's no bad thing as the standard model retains a modern look without being in your face. Even though Dell has done a good job in producing an even white across the palmrest and screen on the review model, this variant looks like more like a souped-up netbook than premium Ultrabook. Give me silver and black all day long. The 'up-your-nose' webcam, a bugbear from the previous model, remains here, but there's nowhere else to put it if persisting with the near-borderless screen. The 720p snapper is moved into the middle and is augmented by an IR camera for easy-peasy Windows Hello login. Dell does a good job with the hinge. It's stiff enough not to move easily and can be pushed back by around 45° for a decent viewing angle. As before, Dell impresses with the near-borderless screen, though the available options don't tick every box. The base model calls for a 1080p (FHD), non-touch display. This is an oversight in our opinion because the display is begging for touchscreen capability - after using a Microsoft Surface for over a year I found myself trying to scroll pages by instinct. You'll need to invest in the pricier 4K option for finger support, and that'll add to the cost and reduce battery life. That said, the matte FHD-equipped model is bright, even, and has fantastic viewing angles. It's eminently usable at just 20 per cent brightness, helping spur on battery life, which as you will see later on in this review is really solid. FHD just about works on a 13.3in panel once scaling is set to 150 per cent in Windows, though we do lament there being no middle-resolution option, preferably with touch. Speakers are perhaps the least noteworthy part of the XPS 13, producing basic audio lacking heft. Dell says it has worked hard on cooling in order to offer impressive long-term performance. There's significant venting around the upper part of the keyboard, but rather than cause a racket at the first sign of load, the twin internal fans spin up at a steady hum. It's never loud, even under the most duress, and remains silent when playing back a video. Getting warm to the touch when the CPU or GPU are running flat out, we measured a maximum 49°C temperature along the top-left edge of the keyboard. Hot, but not uncomfortably so. 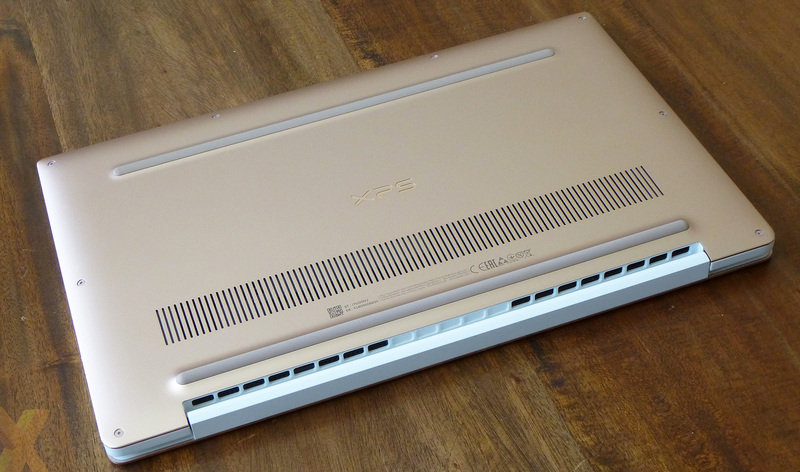 Though aping the previous-generation XPS 13 9360 in some areas, this is a different chassis altogether. Dell has retained the same weight (1,220g), width and depth but has shrunk the thickness considerably, down from a maximum 15mm to just 11.6mm. Great for aesthetics, but you'd think limiting internal space will inhibit cooling potential and performance. Prepare to be surprised in the benchmarks. What's more, a thinner chassis means a smaller battery - down from 60WHr to 52WHr. The super-thin profile, helped by having a slimmer lid, does come at a cost of immediate port connectivity. Dell has shelved USB Type-A in favour of forward-looking Type-C, but fear not, as the XPS 13 is bundled with a Type-A-to-Type-C adapter. A couple of said Type-C ports line the left-hand side. Handily, both support Thunderbolt 3, connected to the system via a speedy x4 PCIe interface. On the other side, a further Type-C (USB 3.1 Gen 2) offers external video support by doubling up as mini-DisplayPort. All three ports provide charging via the bundled 45W adapter, but do know that, if you don't use the bundled charger, a minimum 27W is required, ruling out most Powerbanks. As a guide to refuelling, we charged from flat to 50 per cent in about 40 minutes. Dell also includes a micro-SD card reader, 3.5mm audio jack, and a basic battery-life indicator. We're not bemoaning a lack of USB Type-A or Ethernet port given the Ultrabook's svelte profile. WiFi is provided by Killer once again, this time with its 1435 802.11ac/Bluetooth 4.1 combo. Having a thin chassis can be cause for concern with respect to the keyboard and trackpad. That's not the case here, as the XPS 13 9370's rigid base stops any kind of flexing at normal pressure. Sure, you can make it bend in the middle with a substantial amount of force, but kudos to Dell for slimming the chassis down without issue. Dell hasn't changed either the backlit keyboard or trackpad between generations, sensibly, and both remain excellent. The base thinness doesn't detract from the typing experience - it's immediately familiar to XPS owners - and the Precision-enabled trackpad, whilst rather loud on the buttons, is accurate. About the only thing we'd change is the tiny up/down/left/right keys on the lower right. The sum of improvements means that Dell has hiked the entry price of the XPS 13 9370. A near-base configuration of Core i5-8250U, 8GB of LP DDR3 RAM, FHD screen, 256GB SSD comes in at £1,149. Our review model, whose specs comprise the Core i7-8550U, 16GB RAM, FHD screen, and 512GB NVMe SSD ups the financial ante to £1,650. Opting for the 4K touch screen adds just another £50 to that total, and all are backed by a standard one-year warranty. Of course, being a slim Ultrabook negates any opportunity of having discrete graphics. Intel's UHD 620 is your lot, largely carried on over from the previous generation, so don't expect scintillating GPU performance unless you invest in an external GPU box. One minor blot on an otherwise tasty machine is the presence of McAfee Live. There's a bunch of Dell software, ostensibly for energy management, though there's little reason to venture too far into these apps. Enough preamble, let's now see how it stacks up against some serious competition.